The time is fast approaching to honor your NJHS students with the NJHS Outstanding Achievement Award! Nominations open January 14 and are due by February 25, 2019. 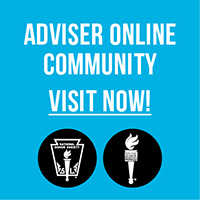 Chapter advisers may submit as many members in good standing as they wish. (Note: Past recipients are not eligible.) Winners receive $500 in the form of a 529 college savings plan account. Recognize and reward those students who truly embody the five pillars of NJHS—scholarship, leadership, service, citizenship, and character. Visit www.njhs.us/oaa for more information. Attention advisers, principals, and faculty: Put your finishing touches on recommendations for your NHS scholarship students! The deadline to submit is December 14. For more information, visit www.nhs.us/scholarship. It takes a special energy and a high degree of commitment to be an NHS or NJHS adviser—and that hard work and dedication deserves special recognition through the Rynearson National Adviser of the Year Award. Principals from schools with active NHS or NJHS chapters may nominate their chapter adviser for this prestigious honor, and the national winner will receive a $500 award from NASSP and a plaque to commemorate the recognition. In addition, each state with an official NHS or NJHS state association may nominate one NHS or NJHS adviser. Nominations are already being accepted—visit www.nhs.us/awards today! Planning for the 2019 National Student Council Conference is already under way! This year, the conference will be held June 24–26, 2019, just outside of Pittsburgh at South Fayette High School in McDonald, PA. The theme—Forging Student Leaders—seeks to light the fire within students, advisers, and administrators as they connect with their peers and discover new ways to enhance their leadership abilities. Join middle level and high school student leaders and advisers from across the country for this motivational three-day event. Be sure to check out www.NatStuCoConference.org for updates! There’s still time to register for the upcoming LEAD Conferences! Plan a visit to our nation’s capital for LEAD DC, February 1–3, 2019, or take a trip to the Windy City for LEAD Chicago, March 22–24. These engaging weekend-long events share proven leadership techniques, tips for improving school culture and climate, and advice to prepare students for their academic futures. But hurry—early bird registration for LEAD DC ends December 31, and the early bird deadline for LEAD Chicago is February 15. Visit www.leadconferences.org for more information.